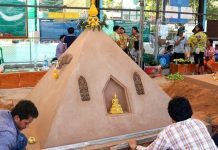 Jomtien Beach vendors are complaining their low season is about to get a lot worse as the 600-million-baht shoreline renovation project moves into Dongtan Beach. Along with landscaping, a six-meter-wide access road from the Dongtan police box to the Rabbit Resort will be built as well as a larger parking lot. Work is scheduled to finish late April 2018. 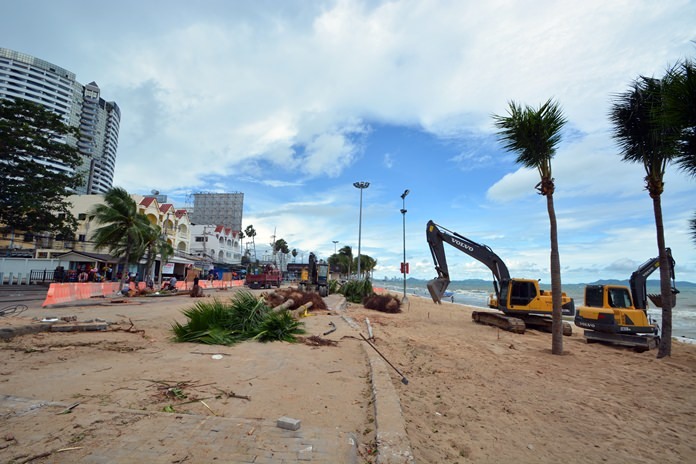 Jomtien Beach vendors are complaining their low season is about to get a lot worse as the 600-million-baht shoreline renovation project moves into Dongtan Beach. Beach chair renters, street hawkers and masseuses moaned they were not given any warning when workers began demolishing the sidewalk and uprooting trees. 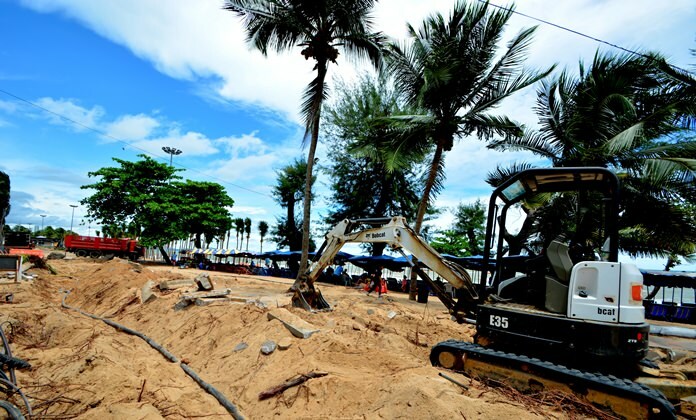 But Jomtien Beach’s renovation has been underway for more than a year with the project details repeatedly publicized. The year-long 600-million-baht Jomtien Beach shoreline renovation project has moved into Dongtan Beach. The Dongtan phase covers 7.8 sq. kilometers and is budgeted to cost 45.4 million baht. Nong Nooch Landscape and Garden Design is the lead contractor with completion scheduled for late April 2018. Along with landscaping, a six-meter-wide access road from the Dongtan police box to the Rabbit Resort will be built as well as a larger parking lot. Vendors whined that the sidewalk is now full of sand and trees that provide shade for customers have been removed, discouraging people from visiting. More reasonable sellers, however, said they will make the best of it and conceded that low season was the best time to do the work – although construction will continue through the next high season. Mokra Yawapee, an architect with Pattaya’s Engineering Department, said the Dongtan project is split into two zones, with the initial Zone A running 200 meters from the police box to the Welcome World Resort. Zone B spans 250 meters from Welcome to Rabbit Resort. The Zone A footpath will be expanded from five meters to seven and the section that curves into the sand will be removed, providing beach goers more space. Large trees removed now will be replaced with palm trees so that branches do not fall and injure people in thunderstorms. Dongtan is the third of four phases in the overall Jomtien renovation.